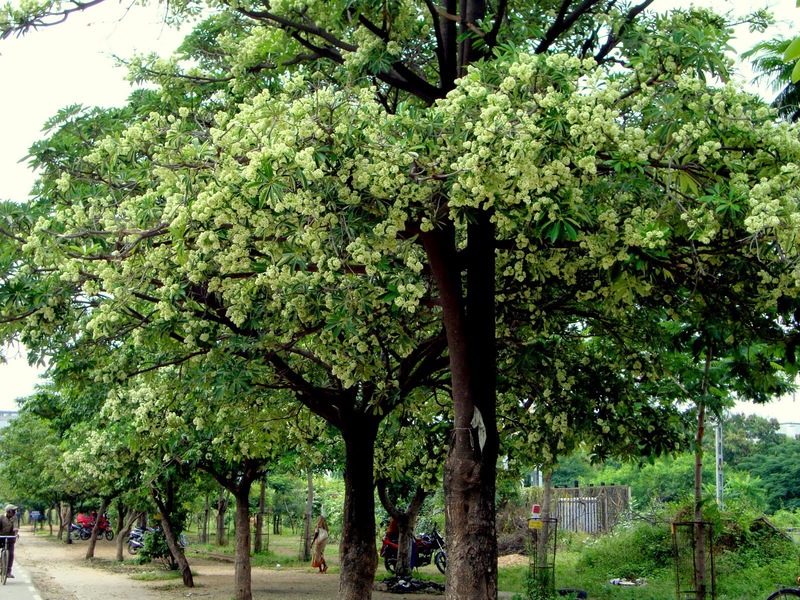 Alstonia Scholaris is an elegant evergreen tree found in many parts of India. These trees can grow very large, such as Alstonia pneumatophora, recorded with a height of 60 m and a diameter of more than 2 m. Alstonia longifolia is the only species growing in Central America (mainly shrubs, but also trees 20 m high). The generic name is in memory of the distinguished botanist, Prof. C. Alston (1685-1760) of Edinburgh. The species name scholaris is attributed to the fact that the timber of this tree was traditionally used to make wooden slates for school going children. Also commonly known as the Devil Tree, in mythology and popular imagination it is considered to be the abode of the devil. 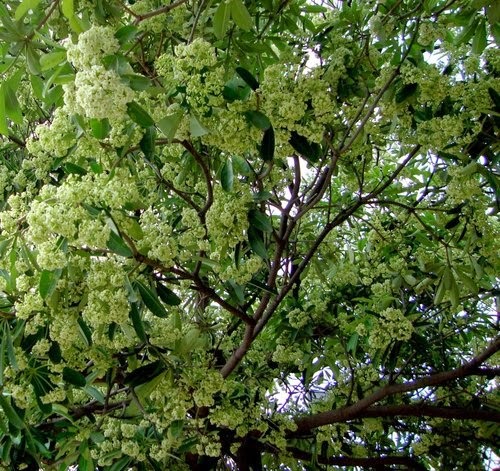 From late October onwards small, green yet extremely fragrant flowers appear on this trees. It is commonly accepted that the fragrance from one tree can intoxicate up to a kilometer of polluted road. A tall elegant tree it has a greyish rough bark. Branches are whorled, and so are the leaves - several of them coming out of the same point. The tree is really elegant whether it is flowering or not. The slightly rounded, leathery, dark green leaves form whorls of 4-7. It has very regular branches and gives the tree a beautiful shape and look. The wood is extremely soft for making anything durable- hence it is usually used for making packing boxes, blackboards etc. Its bark known as Dita Bark, is used in traditional medicine to treat dysentery and fever. On the Western Ghats of India, tribal people do not sit or pass under this tree for fear of the devil. The leathery, sessile, simple leaves are elliptical, ovate, linear or lanceolate and wedge-shaped at the base. The leaf blade is dorsiventral, medium-sized to large and disposed oppositely or in a whorl and with entire margin. The leaf venation is pinnate, with numerous veins ending in a marginal vein. The inflorescence is terminal or axillary, consisting of thyrsiform cymes or compound umbels. The small, more or less fragrant flowers are white, yellow, pink or green and funnel-shaped, growing on a pedicel and subtended by bracts. They consist of 5 petals and 5 sepals, arranged in four whorls. The fertile flowers are hermaphrodite. The gamosepalous green sepals consist of ovate lobes, and are distributed in one whorl. The annular disk is hypogynous. The five gamesepalous petals have oblong or ovate lobes and are disposed in one whorl. The corolla lobes overlapping to the left (such as A. rostrata) or to the right (such as A. macrophylla) in the bud. The ovary has 2 separate follicles with glabrous or ciliate, oblong seeds that develop into deep blue podlike, schizocarp fruit, between 7–40 cm long. The plants contain a milky latex, rich in poisonous alkaloids. The Alstonia macrophylla is commonly known in Sri Lanka as 'Havari nuga' or the 'wig banyan' because of its distinct flower that looks like a woman's long wig. 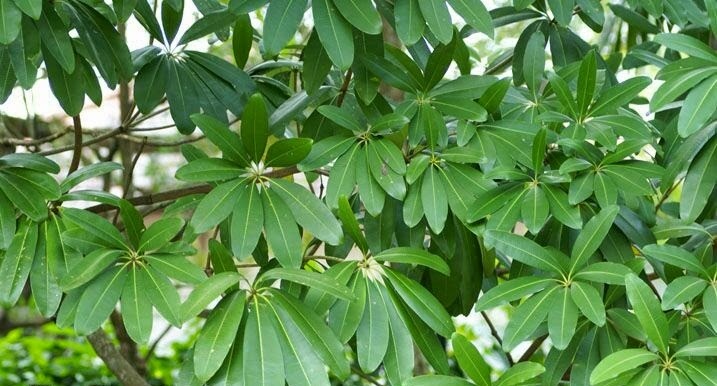 Alstonia trees are used in traditional medicine. 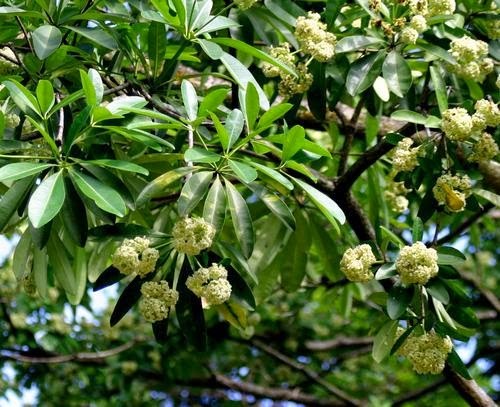 The bark of the Alstonia constricta and the Alstonia scholaris is a source of a remedy against malaria, toothache, rheumatism and snake bites. The latex is used in treating coughs, throat sores and fever. Many Alstonia species are commercial timbers, called pule or pulai in Indonesia and Malaysia. Trees from the section Alstonia produce light timber, while those from the sections Monuraspermum and Dissuraspermum produce heavy timber. Alstonia trees are widespread and mostly not endangered. However a few species are very rare, such as A. annamensis, A. beatricis, A. breviloba, A. stenophylla and A. guangxiensis. 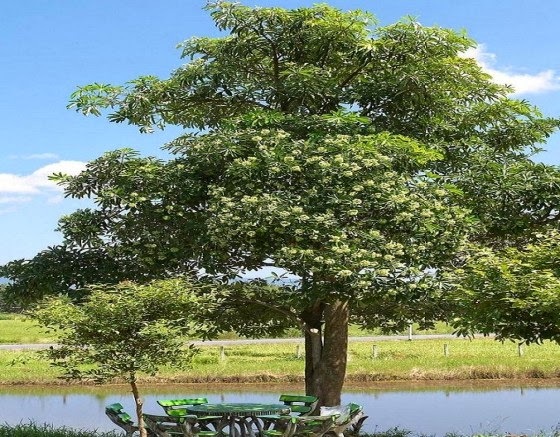 One hundred Alstonia Scholaris trees will be planted on the Yamuna Banks of Delhi NCR near Shastri Park, Okhla and Sarita Vihar starting from World Environment Day. the 5th June 2014. Give me TreesTrust and Sustainable Green Initiative are working together to plant 100,000 trees in Delhi NCR in 2014.